New England Patriots defeat the Buffalo Bills, improving to 10-5. Although this was a double digit victory for the Patriots, it was riddled with issues and imperfections. The running game looked strong: 47 carries for 273 yards, 2 touchdowns, and a fumble. 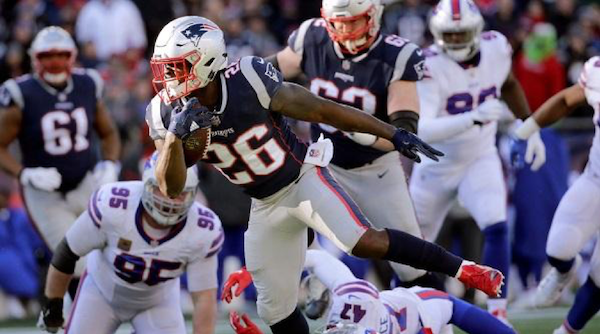 Sony Michel was the leading back with 18 carries, 118 yards, and a touchdown. Many had speculated the Pats would switch to to a run heavy offense after Josh Gordon left to focus on his health. I don’t think anybody saw Bill Belichick drawing up a game plan with twice as many runs as passes: 47 rushes to 25 pass attempts. Aside from the success on the ground, the Patriots offense struggled. The offensive line had issues all game against the Bills pass rush. Tom Brady look uncomfortable, even jittery. His body language suggested he was afraid of getting hit every time he dropped back. Brady went 13/24 with 126 passing yards, 1 touchdown, and 2 interceptions. One of the interceptions went right through Rob Gronkowski hands, reaching Bill’s safety Jordan Poyer in the endzone. The Patriots turned the ball over 3 times in this game. Ball security has to be the main focus this week in practice. Belichick knows you can’t win playoff games if you turn the football over 3 times. The defense looked really really good, making it two strong performances in a row. 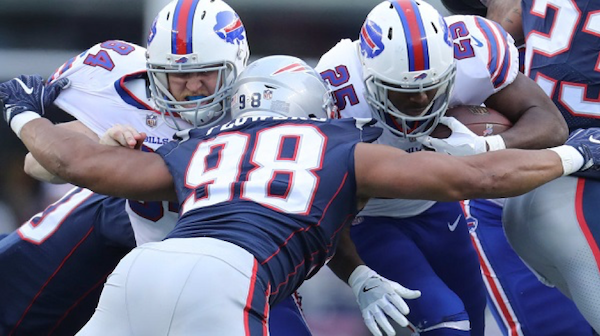 The Patriots only allowed the Bills to score 6 points in the first 59 minutes of this game, giving up the lone touchdown with just 1 minute remaining. The Pat’s defense caused 3 turnovers (2 interceptions and 1 fumble recovery), neutralizing their offense’s giveaways. That being said, the pass rush continues to be a problem. Yet another week comes without a sack. Once the playoffs come around, the Pat’s will NEED to have a pass rush. If you can’t get in the face of Roethlisberger, Rivers, or Mahomes, they will pick this defense apart. On a positive note, the defense stopped the run all day long. The Bills couldn’t get anything going on the ground, forcing them to go pass heavy with a rookie quarterback. Overall this was a very important win for the Patriots. They’ve clinched the AFC East and with a Texans loss will switch spots in the standings. Now the 2 seed in the AFC, the Patriots are looking at a first round bye and at least 1 home game. This is huge if we consider recent history. The Pats have never made the super bowl in a year they didn’t have a first round bye. With an aging roster, they are going to need the rest to prepare both physically and mentally. Big win for them, but they have a lot to work to do going into next week. Before anyone can start thinking about the playoffs, the Patriots need to beat the New York Jets to keep the 2 spot.